As you and your family prepare for winter, do you include your pets in the planning? Fido and Fluffy may have warm coats, but that alone doesn't make them immune to cold weather. Here are some helpful tips to keep your pets safe and healthy through the winter. Cats should remain indoors year-round, but it's particularly urgent during the winter months. Our furry friends have been known to climb inside cars to warm up beside the engine block, putting themselves in danger due to unsuspecting drivers. If you take your dog outside for a walk or potty break, be sure to wipe his paws thoroughly when you get back inside. Salt and other ice-melting chemicals can damage his paws and cause severe illness if ingested. Plan walks during warmer midday hours when the sun is more likely to be out. 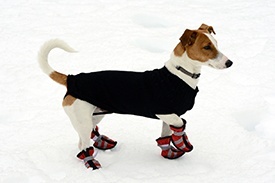 Doggie boots, coats and hats may seem frivolous, but they're the best way to ward off frostbite in paws, ears and other extremities. Even a tiny taste of antifreeze can be fatal. Keep your dog away from cars and garages and monitor your own vehicle for leaks. If your pet becomes unsteady on his feet or begins convulsing, seek emergency treatment from your vet immediately. Locking a dog inside a car during cold weather is no safer than doing it during warm weather. Never leave a pet unattended in a car for any length of time. Since pets are less active during the winter, adjust their diet accordingly to prevent weight gain. Antibiotics and other medications are good for you, not so much for your pet. Don't treat pets with human meds, and store them safely out of reach. Give your pet a warm, cozy nook to relax and sleep. It doesn't have to be a fancy, expensive bed. A nest made from pillows and blankets keeps your pet off the floor and away from drafts. Cats and dogs love to curl up near heat, so avoid the use of space heaters and keep a close eye on pets around heat registers. Cold, dry winter air can cause pets to become dehydrated. Make sure your pet has regular access to clean drinking water, and consult your vet about supplements such as fish oil that can help keep his skin and coat healthy. The leash-free dog parks at our Springs luxury apartment homes provide a safe and convenient place for outdoor activity any time of the year. Stop in and visit with our on-site management team to learn more about our pet-friendly communities!